The development of high-sensitive microscopic techniques, together with the development of methods for the conservation of cells and the improvement of methods for obtaining ultra-fine sections, gave rise to the knowledge of the cellular structure in the second half of the twentieth century. The combination of these techniques with immune-cytological techniques and the use of computational systems of image analysis have increased the interest in the use of electron and confocal microscopy in biological research. Knowing which areas of the cell morphology are being altered after treatment is essential to establish new physiological or biochemical measures for the in detail study of the effects of stressing factors on plants. A general view of the root or shoot tissues examined under microscopy will allow the identification of cellular organization, where alterations can be detected as erroneous division patterns, loss of cell identity or cellular disorganization (Rost et al. 1996; Zhu and Rost 2000). 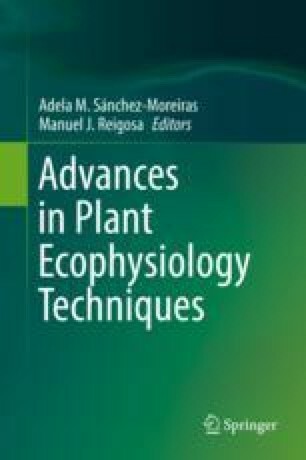 In particular, root tips act as finely tuned sensor for different kinds of stress, which makes their study especially interesting for interpreting the plant stress response. The implementation of these techniques was possible thanks to the invaluable assistance of Inés Pazos and Jesús Méndez from the Central Research Services (CACTI) of the University of Vigo.